Bitcoin has, yet again, crossed an all-time high, crossing the $12,270 mark yesterday. Despite many conspiracies against the cryptocurrency, bitcoin has again broken all records touching $12,270 — and it currently stands at $12,180. 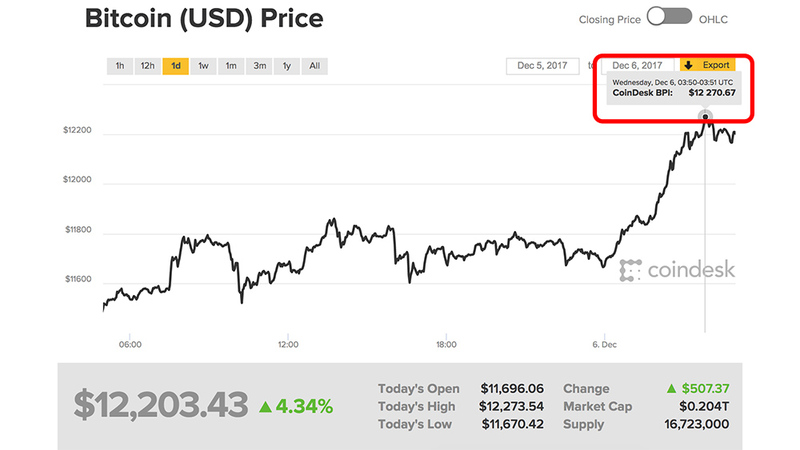 Last week, after surpassing $10,000 mark, Bitcoin gained over $500 since the opening on Tuesday — which is a gain of over 4%, overall. Now, after crossing the $12,000 mark, Bitcoin’s market capitalization has been pushed above $200 billion for the first time since its inception. Even with the constant rise in bitcoin’s price, people still consider this technology as a ‘bubble’ that could pop anytime soon. This bubble won’t burst soon … the price will continue climbing to reach a new all-time high level. hmasha chaar aane wali baat karna bewaqoof! The South Korean tech giant and largest smartphone manufacturer, Samsung is once again up to something to astonish its consumers. Samsung recently announced that it has started mass production of world’s first 512GB embedded Universal Flash Storage (eUFS). Samsung’s upcoming flagship phones are expected to feature this embedded chip. Just one question, whether bitcoins are Islamic or not? Aap ye btaein ke Islamic Kyun nhi hai??? Aur kya ye jo rupee currency hum istimal kartay hain jis ki bunyaad hi SOOD par hai kya ye b Islamic hai? Some one in Turkey has said it is un-islamic. You know, computing power and electricity required to mine a single Bitcoin is almost 50-75% of it’s value. Besides, China has set up acres of server farms in Mongolia and Latin America just to mine bitcoins. No hope of ordinary people like me to even dream to have one Bitcoin in our wallet. The only people who can make money is those offering crypto currency wallet. One other thing, Bitcoin was created by none other than ELON MUSK. Bitcoin bubble will burst in no time, its a virtual money which nobody owns the responsibility. so, hold your horses and wait for the climax. Just this week, Tesla and SpaceX founder Elon Musk denied being Bitcoin’s creator.